Matt Brown is the lead singer and guitar player from the Portland, Oregon area band Ruby Hill. 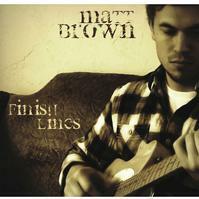 Finish Lines is Brown’s first solo album and it’s a great start. Great melodies are set to emotional lyrics in more of an acoustic setting than his sound with Ruby Hill. Brown is the singer/guitarist. Marc Jones provides the percussion while Jacob Battan plays bass guitar. If you like John Mayer or Dave Matthews, you will probably enjoy Brown’s work. His vocals sound similar and the melodies are a great reminder of some of the best Mayer has played. This is all original music and it is full of sentimental lyrics and a soft rock ‘70s sounds that will take you back in time, while giving a fresh take on that softer side of rock. “When You Want Someone” opens with some of the funky guitar I remember from Ruby Hill’s two albums. Great sounding vocals similar to John Mayer/Dave Matthews are set to some funky rhythms on bass and lead guitar. The drums keep great time. Good lyrics are driven with good melody. This has a relaxing smooth jazz rhythm to it. It’s a love song written to either attract or celebrate the woman you love. “Loved but Lonely” opens with excellent acoustic guitar before the drums join. It’s a good song of longing set to solid guitar, bass and drums. “Where are you now? / Are you in this town?” opens “I’ll Be Here (When You Get Here), set to thumping bass, drums, and guitar. It features excellent rhythm and melody with good lyrics. A cool electric guitar riff opens up before Brown joins in singing. Then we get more great rhythm and moods. A big long slow guitar riff opens “Do You Ever Wonder” before Brown joins in singing, “Did you ever wonder where that stranger come from?” This is another great vocal driven song full of emotion. This opens with Brown on vocals accompanied by slow guitar support. It’s a great closer reaching out to the one you love with emotion and feeling, despite the cold weather.